This quilt was begun with a mission in mind - to help both our craft center and the National Middle Creek Battlefield which is down the road from David Appalachian Crafts. I used the battlefield map that is on the brochure for the battlefield, and used the greens to indicate trees, grass and browns to indicate dirt. I used photo's on fabric for the pictures of General Garfield (Union) and General Marshall (confederate) and also the picture of the "Kentuckian vs. Kentuckian" This was my second quilt and I enjoyed making it very much - especially the quilting. My husband said I was spending too much time in my sewing room, to which I replied, "You say that like it's a bad thing..." I enjoyed making this quilt, but like quilts and children, they sometimes have a life of their own. 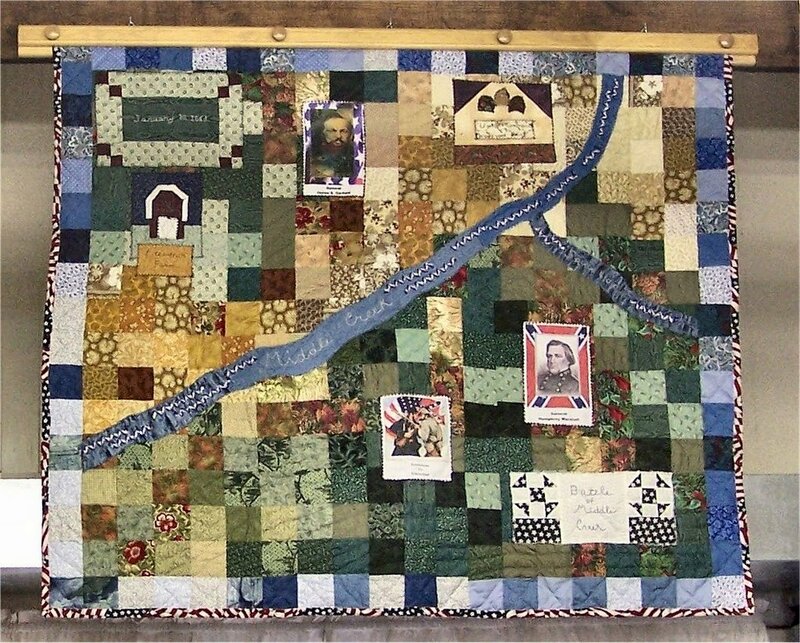 I hope this quilt journeys for many days after I am gone.